The Wound & Wound Toy Company has tons of great wind-up toys, tin toys, and music boxes. They have a very extensive product line, including the classic the string-climbing monkey for about $16 USD. 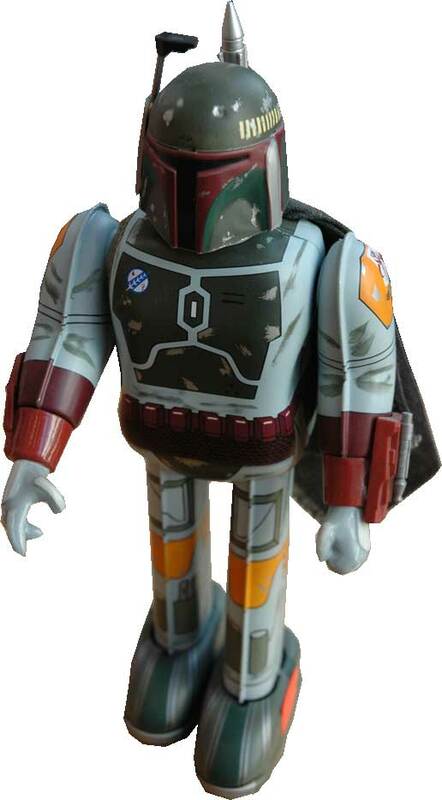 On the more exotic side, they even have a wind-up lithographed tin Boba Fett. Made in Japan and standing at about 9.5 inches tall, this one will set you back around $250 USD. This item is a bit of an exception; most of their products are very affordable. A note about their site navigation: once you click on a given section (say "Tin Collectibles"), you need to go to the bottom of the page to find the link for the next set of items in that category. Look for the circles with numbers in them. Check out all the wind-up toys, tin toys, and music boxes at The Wound & Wound Toy Company.